There are plenty of reasons for going to the Burgenland: Birdwatching, for example (that′s what I used to do there), wine tasting (something else I have done), having a good time in the spas, doing water sports in Lake Neusiedl or cycling tours in the National Park Neusiedler See (all things I havn′t done). The one thing only very few people do in the Burgenland is serious sightseeing in the capital Eisenstadt. This is partly because of the other attractions of Austria′s most eastern (and most exotic) province, but partly also because of the bad image of Eisenstadt. Most Austrians consider the Burgenland to be underdeveloped and rural. Despite of them probably being right, you need to keep in mind that being rural is not a bad thing - yet for sightseeing in Eisenstadt it might well be. So let′s have a look at the city. What used to be a village with no administrative role at all was forced into being a capital in the 1920ies, when manipulated votes made the logical capital of the Burgenland - Ödenburg - the Hungarian city of Sopron. Deprived of its core, the youngest and least developed province of Austria suddenly had to find a new centre and decided to use the village (town?) of Eisenstadt. Today, the capital is striving with a three-block-Altstadt, a supermarket AND a pub. But wait, there′s more: A 15th century parish church that was officially made a cathedral in 1960 - which is pretty much the only thing worth noting about the chur…cathedral. The Rathaus or Town Hall has a baroque façade and the street around it is the pedestrianised heart of Eisenstadt. Much more impressive is the Schloss Esterhazy Castle. The Princes of Esterhazy proved to be loyal followers of the Habsburgs for more than 400 years and gradually rose to one of the most powerful and most distinguished houses in the empire. Even today, the Austro-Hungarian Esterhazys are among the country′s wealthiest families. However, there are several lines of Esterhazys and they own several impressive castles. In Austria, these are mostly the one in Eisenstadt as well as Burg Forchtenstein in the southern part of the Burgenland. The Schloss Esterhazy of Eisenstadt was originally built as a military fortress in the Middle Ages. However, with the Esterhayzys being loyal servants to the Habsburgs during Turkish wars, revolts of the Hungarian nobility and the revolution of 1848, they continued to develop the building over the course of the eventful centuries. The result is a quite unusual mix of medieval, Baroque and neo-Classical architecture. It is used by the province′s administration, the Esterhazy family and as a museum that organizes guided tours. The Haydnsaal Hall is the most important of the representative rooms inside the castle. Joseph Haydn was the court composer of the Esterhazy family and gave many concerts in this room. It is considered to have excellent acoustics and there are still classical concerts organised in these sacred halls. Other parts of the museum are dedicated to the extensive art collection and treasury of the Esterhazys (although the more impressive part of this collection is on display on Burg Forchtenstein Castle), and other representative halls and rooms. 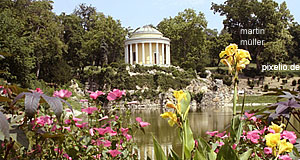 It is also worth checking out the Schlosspark, which was outlaid in its current form in the 19th century. Only some hundred metres off the castle you can find the former Jewish district of Unterberg. The district was used first as a ghetto and then as a Jewish quarter (which was closed on Sabbath with an iron chain) until 1938, when the 446 Jews of Eisenstadt were collectively deported to concentration camps. Today, you can find the "Österreichisches Jüdisches Museum" (Austrian Jewish Museum) in Unterberg. The private praying room of the "Wertheimer′sche Schul" itself justifies coming to the museum. Samson Wertheimer was an influential scholar in the 17th century and owned the building. Some parts of the exhibition are dedicated to the Hungarian Jews, who were more numerous than their Austrian counterparts. The Burgenland′s province museum is situated in another Unterberg house nearby and tells the story of the Burgenland since Neolithic days, with some highlights from the Roman period and dramatic insights into the struggle for the Burgenland in the early 1920ies, after the Empire had split up into many smaller countries and Hungary and Austria tried to get hold of this place. Other sights include the Haydnhaus, where you can learn a few things about the composer, who lived in this building between 1766 and 1788. The composer himself decomposes in a tomb near Bergkirche church. More precisely, he rests in a mausoleum that the Esterhazys have built for his decapitated body in 1932. The skull had been stolen by one of his friends in 1809 and was later owned by the "Gesellschaft der Musikfreunde" ("Society of the friends of music") in Vienna. A happy end came in 1954, when body and skull were finally reunited here in Eisenstadt. If you book a tour to the Bergkirche Church, you can also visit the impressive Baroque Kalvarienberg (Calvary Hill), which commemorates the passion of Christ and aids pilgrims in their endeavours to commemorate the crucification. Nearby attractions include Burg Forchtenstein Castle south of Eisenstadt, the National Park Neusiedler See (the main thing in northern Burgenland) and the pilgrimage basilica of Frauenkirchen dangerously close to the Hungarian border.